Democrats and Republicans are not mirror images of each other. Will this asymmetry last under Donald Trump? Regular readers of the Atlantic Sentinel will be familiar with Matt Grossmann’s and David Hopkins’ theory of asymmetric politics. I’ve referenced their thesis to argue why Hillary Clinton, not Bernie Sanders, was the proper Democratic candidate in 2016 and how Republican anti-establishment sentiment wrecked American politics. Now they have put their theory in a book, which goes into greater detail and explains how this asymmetry between the parties manifests itself in other areas, like the media and policymaking. Grossmann and Hopkins help us make sense of some of the perennial frustrations of American politics. Democrats, to the exasperation of those of us who genuinely believe in small government and free markets, never tire of calling Republicans the party of the rich. Republicans, to the exasperation of liberals and progressives who simply want to do right by minorities, women and working people, confuse Democrats for left-wing ideologues. The parties aren’t actually mirror images of each other. The Democrats, argue Grossmann and Hopkins, are best understood as a coalition of interest groups; the Republican Party as the agent of the conservative movement. Seen through this lens, American politics make more sense. This explains why Democrats are on the whole more pragmatic: They must constantly balance competing group and identity interests within the party, so compromise comes naturally to them. They don’t understand why it’s so hard for Republicans to do the same. Republicans, on the other hand, are united by their devotion to conservative principle, which is why they can often seem so intransigent. To them, compromise is surrender. This also explains why it’s so hard for Republicans to actually govern. They are elected on abstract promises to shrink government, which voters like. But once they introduce concrete spending cuts, voters tend to revolt. If Republicans back down, they’ll be punished by true believers in the primaries. If they persevere, they risk losing power. There is a similar left-right asymmetry in the media, according to Grossmann and Hopkins. Liberals and progressives like to see “their” news outlets as objective and facts-based and conservative ones, like Fox News, as cynical and sensationalist. Conservatives know Fox isn’t impartial but believe CNN and The New York Times aren’t either — and that they’re either ignorant of their bias or trying to hide it. The truth may be somewhere in the middle. What’s important to understand is that the source of the confusion is that the two sides see each other as they see themselves. If only Democrats and Republicans understood that their respective motivations are different, they might be able to recognize the best, instead of the worst, in each other. Another peculiarity about the American system that owes much to this asymmetry is the excessive use of contractors and grants. This “submerged” or “delegated” state is largely foreign to Europeans, who are more comfortable with big government. It may surprise you to learn that the absolute number of federal employees has barely changed from the middle of the last century. It surprised me, because the federal governments provides far more services now than it did then. The difference is made up by dramatic increases in state and local workers as well as contractors in the public sector. Grossmann and Hopkins argue that this is the result of Americans’ conflicting preferences. They like small government in principle, hence their support for Republican ideology. But they also like specific spending programs, hence their support for Democratic policies. In order to meet those expectations, and allow both parties to remain faithful to their principles and their base, the federal government has massively delegated, or outsourced, responsibilities to the private sector. Obamacare, with its mandates and exchanges, is a good example. The trouble with this approach is that it has created a huge Rube Goldberg apparatus to perform what Europeans would consider basic government services. And it’s almost impossible to reform. Legislators are confronted with a lawyered mosaic of previous policies that are the product of competing interests and goals, and usually add new layers without implementing more fundamental reforms. The results increase the responsibilities of citizens as well as their need for information, transferring risk from the government to individuals and the private sector. In the long term, argue Grossmann and Hopkins, this will satisfy neither party. Conservatives are frustrated that government grows by stealth. But many Americans don’t realize it, making it harder for Democrats to sell public programs. The question is if the asymmetry still holds up in the era of Donald Trump. We recently learned that for a large portion of the Republican electorate, “conservative” is less about small-government principle than it is a code for “one of us”. Rather like Democratic group-interest politics. On the left, there is momentum to make the Democratic Party more ideological. The likes of Bernie Sanders and Elizabeth Warren would transform the party into the agent of the progressive movement. 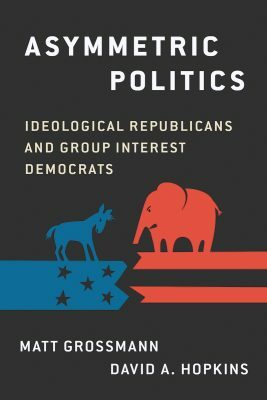 Like the “party decides” theory, which accurately described how nominees were chosen in previous presidential elections but which failed to predict the rise of Trump, Grossmann’s and Hopkins’ theory about asymmetric politics may turn out to be a definitive account of the last sixty years of party politics but less of a guide for what comes next. Rapprochement with Russia: What’s In It for Us?